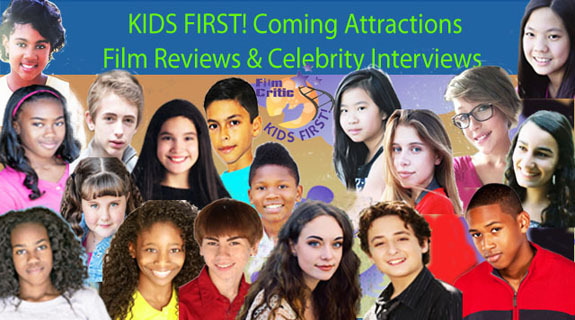 Listen in as we interview Ranny Levy, founder of KIDS FIRST!/ Coalition for Quality Children’s Media and learn about open auditions for new KIDS FIRST! reporters on November 4 at DreamWorks In LA and also how you can apply online to join our team. In this week’s show, we review Birth of a Nation, the Tim Burton film Miss Peregrine’s Home for Peculiar Children and discuss some of our favorite Halloween films of all time. Hosts Keefer Blakeslee and Brandon Cela are joined by KIDS FIRST! Film Critic Willie Jones from Orlando. Before you spend your hard earned dollars at the movies, be sure to listen to what our youth reporters have to say. Listen in as we interview Jo Boag, the Creative Director of Guess How Much I Love You: Autumn Journey, and review Loving, Middle School: The Worst Years of My Life, The Eagle Huntress and Ice Age: Collision Course at the Discovery Cube. Hosts Keefer Blakeslee and Morgan Bertsch are joined by KIDS FIRST! Film Critics Tre’ana and Kamhai. Before you spend your hard earned dollars at the movies, be sure to listen to what our youth reporters have to say. Listen in as we interview Geoff Ramsey and his daughter Millie from the new AT & T Hello Lab series, Schooled, review the films Miss Peregrine’s Home for Peculiar Children, Middle School: The Worst Years of My Life, Masterminds and the DVD series The Adventures of Gumby: The 60s Series, Volume 2. Hosts Gerry Orz and Brandon Cele are joined by KIDS FIRST! Film Critics Na’im, Mia and Kamhai. Before you spend your hard earned dollars at the movies, be sure to listen to what our youth reporters have to say. Listen in as we review the films Queen of Katwe, Paying Mr. McGetty, Peregrine’s School for Peculiar Children, Disney’s Beauty and the Beast: 25th Anniversary edition. Host Keefer Blakeslee is joined by KIDS FIRST! Film Critics Clayton, Morgan and Gerry. Before you spend your hard earned dollars at the movies, be sure to listen to what our youth reporters have to say. You are currently browsing the KIDS FIRST! Radio weblog archives for October, 2016.